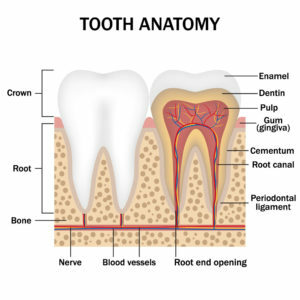 A tooth consists of enamel, dentin and a central pulp chamber. Root canal therapy refers to the process where a dentist treats the inside of your tooth, specifically, that space occupied by its “pulp tissue.” The pulp is the soft area within the center of the tooth. The dental pulp nourishes and hydrates the tooth structure and makes the tooth more resilient, less brittle and less prone to fracture from chewing hard foods. Additionally, the dental pulp provides a hot and cold sensory function. Each of your teeth have a small network of nerves, blood vessels and connective tissue that nourish the tooth and keep it alive. Root canals are the tiny passageways that contain these nerves. 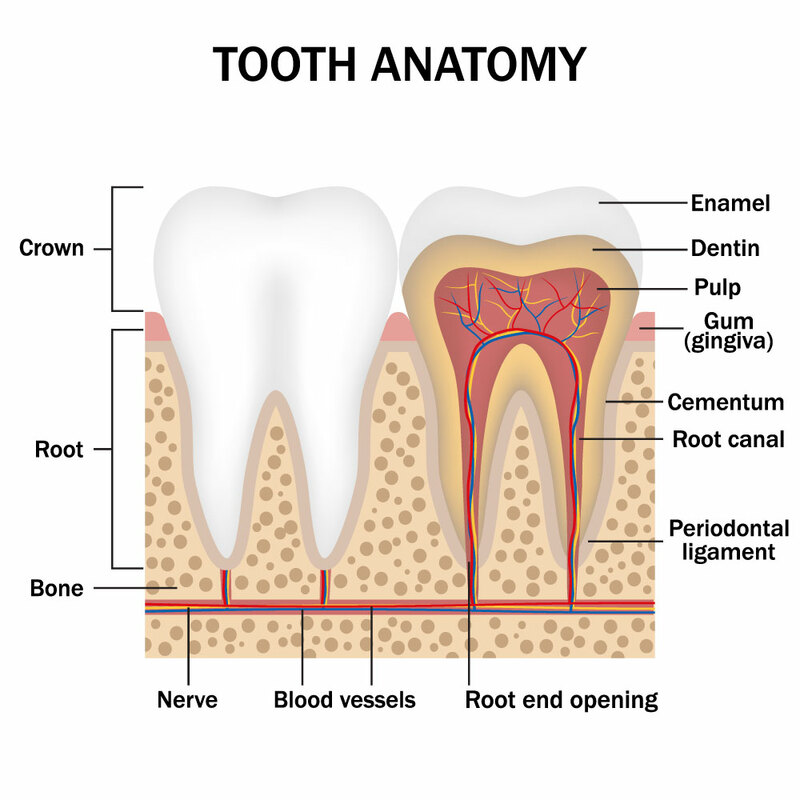 Like pencil lead running through the length of a pencil, root canals make their way through your tooth until they reach the end of the root or “leg” of the tooth. All teeth have between one and four root canals. When you want to avoid pulling a tooth after an infection that reaches the inner tooth, a root canal is performed, which removes the contents of the canals, cleans them, seals them and fills them. Sometimes a crown is also added. When nerve tissue or pulp is damaged, it breaks down and bacteria begin to multiply within the pulp chamber. This can cause an infection or abscessed tooth. An abscess is a pus-filled pocket that forms at the end of the roots of the tooth. An abscess occurs when the infection spreads all the way past the ends of the roots of the tooth. A hole can occur through the side of the tooth which drains into the gums or through the cheek, which drains into the skin. Root canal treatment is done when decay damages or has already killed a tooth. During a root canal, a dentist removes the pulp from the center of a tooth and fills the pulp chamber and canals. This can prevent the development of a painful infection in the pulp that may spread to other teeth or other tissues. A root canal can also treat an infection that has developed into an abscessed tooth. This procedure can relieve toothache, stop infection, and promote healing. Root canal therapy usually requires one to three visits. During the first visit, you will have the area anesthetized and a small hole is drilled through the top of the tooth and into the inner chamber. Diseased tissue is removed, the inner chamber cleansed and disinfected, and the tiny canals reshaped. The cleansed chamber and canals are filled with an elastic material and medication designed to prevent infection. If necessary, the drilled hole is temporarily filled until a permanent seal is made with a crown. 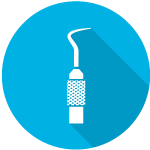 After the root canal, a permanent filling or crown (cap) is often needed. If a crown is needed, the dentist removes the decay, and then makes an impression of the tooth. A technician uses the impression to make a crown that perfectly matches the drilled tooth. The tooth may be fitted with a temporary crown until the permanent crown is made and cemented into place. Root canal therapy is a treatment with a very high success rate. In fact, root canal therapy is designed to save the function a problem tooth. Before the procedure was developed and gained acceptance, the only alternative for treating a diseased tooth was extraction. Most patients who have a root canal experience little or no discomfort or pain, and enjoy a restored tooth that can last almost as long as its healthy original. Call our office for more information on whether or not you may need a root canal.